A remastered version of My Darling Clementine came out in 2016 so I’ve decided it’s high time I take a look at both the film and the quality of restoration. So without further ado here’s My Darling Clementine Blu-ray Review. The year is 1882 and the Earp’s consisting of Wyatt, Morgan, Virgil, and James are driving a herd of cattle to California. On the way they encounter Old Man Clanton and his sons who offer to purchase their cattle. The Earp’s decline the offer and continue into the town named Tombstone. Whilst Wyatt, Morgan and Virgil are in town they leave James to look after the cattle. However upon their return they find him murdered and the cattle gone. Wyatt suspects the Clanton’s are responsible and accepts the role of town marshal and begins seeking to bring those responsible to justice. It’s whilst in town that Wyatt Earp encounters the hot headed Doc Holliday whom he befriends. The film is directed by John Ford with the cinematography handled by Joseph MacDonald. Ford creates a visually pleasing experience that really feels like the old west. The film moves along at a perfect pace allowing the main characters to show their distinctive personas. The music is provided by Cyril J. Mockridge and David Buttolph and plays a significant role in the film as it is indeed the My Darling Clementine song. My Darling Clementine has an excellent cast that really bring this famous story to live. Henry Fonda as Wyatt Earp is outstanding having plenty of presence but in that quiet low-key way that only Fonda can is able to make work. Victor Mature as “Doc” Holliday is the complete opposite of Fonda as his character is struggling to restrain himself which makes for some very interesting scenes especially with Henry Fonda. In fact all of the actors put in fabulous performances. The film of course concludes with a classic shootout. 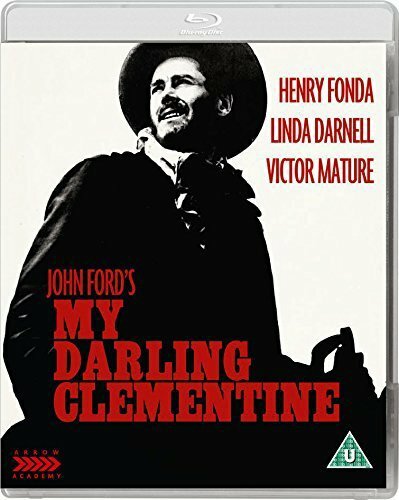 My Darling Clementine is a classic western story well told, acted and directed. This is a must have film for all western fans. Henry Fonda is simply outstanding in his unique quiet but tough style. The film has had a 4K digital restoration and I have to say it really does look fabulous. The picture is sharp and free from any marks. It’s great to see this classic film receiving this sort of attention. The Blu-ray I’m reviewing comes on two discs with the first disc having the “Theatrical Cut” and second the “Pre-Release Version”. There is a nice 42 minute documentary “What is Pre-Release Version?” that explain the differences and why the changes were made. Speaking of the extras there’s a pretty extensive set of extras that are the perfect complement to the film(s). Add to that the addition of the 1939 Frontier Marshal starring Randolph Scott and Nancy Kelly and you really do have the perfect Blu-ray release. That said the two disc edition came out back in 2015 and is now harder to obtain although they are still available from third party sellers. Fear not as Arrow Academy brought out a single disc version in 2017 which is still widely available and contains the same disc 1 content listed below. My Darling Clementine (1946) is available now on Blu-ray. A classic western story well told, acted and directed, this is a must have film for all western fans.